Welcome to Day #2 of Chocolate and Some Enchanted Islands Theme Week. Can't afford to take the vacation of your dreams? No problem. Please join us as we travel the world through chocolate. Today we continue an imaginary vacation to exotic cacao-growing islands. We've started in the Caribbean and we'll end our virtual voyage in the South Pacific and Asia next week. 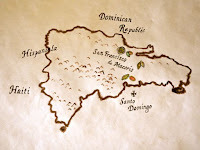 Yesterday we tasted a bar from Santo Domingo, on the south side of the Dominican Republic (DR). Today we move north to San Francisco de Macoris. 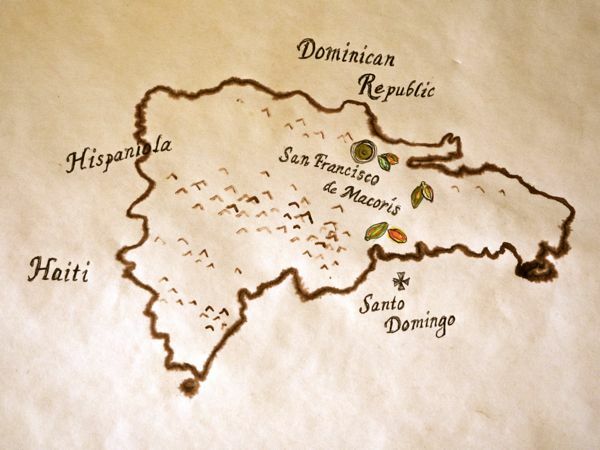 If we were pirates we'd be happy to return to Hispaniola* as the quality of the cacao on this island nation has only gotten better over the best decade. 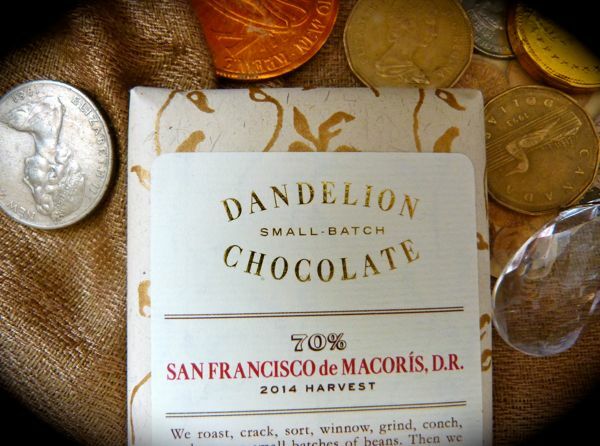 Today's 70% San Francisco de Macoris bar - 2014 Harvest, Batch 2, was hand-crafted by Dandelion Chocolate. 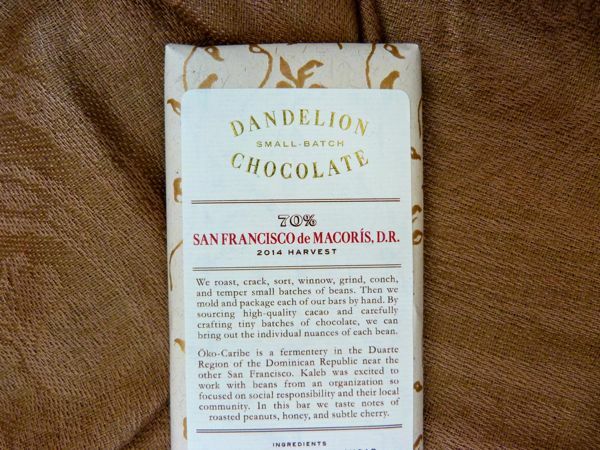 The company's bean-to-bar chocolate factory is based in the Mission District of San Francisco, CA. This DR bar was made with just two ingredients: cocoa beans and sugar. The cacao beans came from a fermentery**, Oko-Caribe, located in the Cibao region of the Dominican Republic, near the city of San Francisco de Macoris. The resulting bar had a subtle, complex aroma with hints of earth, green coconut, floral and marshmallow notes. 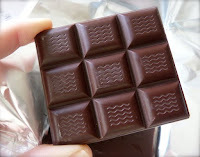 The chocolate broke with a hard snap (a sign of a well-tempered chocolate) and had well-balanced acidic fruit flavor (dried tart cherries, citrus)—with a very slight earth note at the end of one of the last bites. 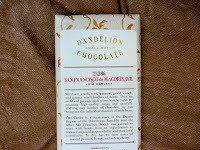 Tasting notes from Dandelion on this single origin bar read: "roasted peanuts, honey, and subtle cherry." This chocolate was an easy bar to enjoy and disappeared quickly. We're storing a few of these in our chocolate vault for the duration of the voyage. *The name Hispaniola dates back to the arrival of Spanish explorers and colonizers. Christopher Columbus landed on the large Caribbean island in 1492 and dubbed it La Isla Espanola—a name that eventually became Hispaniola. Hispaniola refers to the entire island, consisting of The Republic of Haiti (to the west) and the Dominican Republic (to the east). **A fermentery is an in-country facility that accepts freshly harvested pulp-covered, cacao seeds (beans) from growers. Fermentery workers help ensure that fermentation (the first important step in flavor development) is successful. The 5-7 day fermentation process takes place in a series of boxes or containers (and sometimes incorporates layers of banana leaves to contain or distribute heat generated by the ferment). After about a week, only the familiar brown cacao beans remain; the pulp has drained away. And the beans are ready to be dried, and then purchased by chocolate-makers.